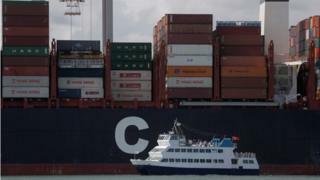 The British Chambers of Commerce has cut its UK growth forecast for 2018, warning the economy faces its weakest year since the financial crisis. The BCC said there was a "lacklustre outlook" for consumer spending, business investment and trade. It said the next few years will "be a testing time for business in the UK". If the forecast for this year is realised it "will be the weakest calendar year growth since 2009, when the economy was in the throes of the global financial crisis", the BCC said. It added: "The BCC urges the government to focus as much as possible on the domestic business environment, reducing the uncertainty that firms face, and take action on skills shortages and poor mobile connectivity, which lower productivity and hold UK businesses back." The group's director-general, Adam Marshall, said: "A decade on from the start of the financial crisis, the UK now faces another extended period of weak growth amidst a backdrop of both domestic and global uncertainty. "Our forecast should serve as a wake-up call to government - as it demonstrates that 'business as usual' is not an option when it comes to the economy." After poor figures on construction and manufacturing and the announcement of major job losses on the high street, fears that the economy has hit a significant weak patch are growing. And there is as yet little sign of the "bounce back" many predicted - including the Bank of England - after the punishingly cold weather of February and March delayed building projects and kept shoppers at home. The BCC said that Brexit uncertainty was affecting firms, with business investment expected to fall by more than half between 2017 and 2018. Growth in the vital services sector - which makes up 80% of the economy - is also expected slow to 1.2%, the lowest level since 2010. The major question is how long this weak patch will continue for. That is likely to depend on those EU negotiations and whether the welcome, though small, rise in real incomes starts to feed through to higher levels of consumer confidence and higher levels of spending. The BCC's head of economics, Suren Thiru, said the group's latest forecast suggests that the loss of momentum in the UK economy in the first three months of 2018 "is more than just a temporary soft patch". He added that UK growth was set to remain well below its historic average for the foreseeable future unless action was taken. Consumer spending could be more subdued in the near term due to a combination of sluggish real wage growth and stretched household finances. And trading conditions for UK exporters could become more challenging as growth in key markets starts to slow down, he said.